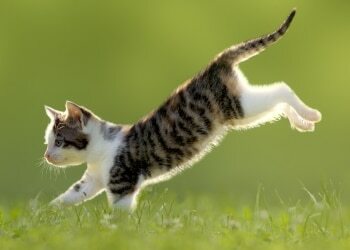 Cats Landing on Their Feet - Are There Health Implications? Cats Landing on Their Feet – Are There Health Implications? As the saying goes, cats always land on their feet! But is this always true? Cats do typically land on their feet when they jump or fall. The vestibular system is responsible for telling the cat when it is not right-side-up, and this system triggers the cat to rotate in mid-air to make sure its feet land first. Cats are very agile and flexible which helps them rotate during their fall to avoid landing on their head or back. When cats land on their feet, their joints absorb the shock associated with the landing. The softer the landing material (carpet for example), the less likely a cat is to injure itself. It is widely known that cats falling from greater heights often sustain fewer injuries that those falling from just a few feet up in the air. This is because the higher falls allow more time for the cat to right itself in mid-air. When cats fall from just a few feet, they often don’t have time to fully rotate and they may land on their sides, back or head causing more serious injuries. If your cat suffers a fall, it may be injured even if it landed on its feet. Hard or uneven landing surfaces, especially in older animals with arthritis and weaker joints, can cause bone fractures, joint and tendon damage, and overall sprains. If your cat is limping after a fall, she should be seen by a veterinarian to rule out any serious bone or joint trauma. Repetitive hard landings over the years, even from jumping off of high places such as kitchen cabinets and tall furniture, can cause minor joint damage each time that contributes to arthritis over the course of a few years. If your cat likes to jump from elevations in the house, provide a soft landing area for him to help minimize joint damage. If your cat doesn’t want to jump on and off of furniture, she may be painful from arthritis or other muscle and joint diseases. If you notice this change in behavior, have your cat seen by a veterinarian to learn what you can do to increase joint health for a longer, happier life!